Fancy cookies made from traditional sugar-cookie dough filled with a mixture of figs, chocolate, and orange marmalade. Colorful sprinkles add festive flair. 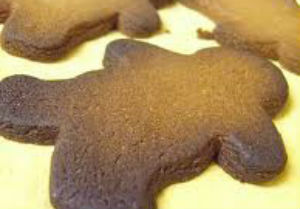 Here is a perfect easy holiday dessert recipe for Fig-Filled Cookies. Process figs and orange zest in a food processor until roughly chopped, about 1 minute. Transfer mixture to a large bowl. Add almonds, marmalade, chocolate chips, 1/4 cup granulated sugar, cocoa powder, cloves, and cinnamon to mixture; combine. 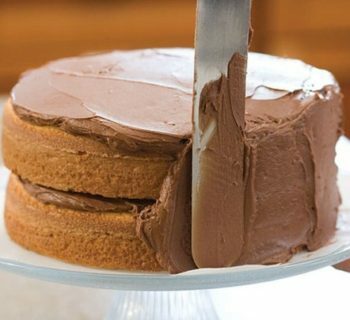 Add warm water, 1 teaspoon at a time (up to 2 teaspoons), until mixture reaches consistency of a thick paste. 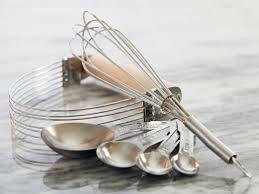 Combine flour, remaining granulated sugar, and baking powder in the bowl of an electric mixer fitted with paddle attachment and mix on low speed. With mixer still on low, add shortening, 1 tablespoon at a time (up to 1 cup), and mix until resembling coarse crumbs. Then add water, 1 teaspoon at a time (up to 1 cup), until dough begins to ball around paddle. Transfer dough to a lightly floured work surface and knead until smooth, 2 to 3 minutes. Place in a bowl, cover with a damp cloth, and refrigerate until chilled, about 30 minutes. Preheat oven to 350 degrees F. Divide dough into 4 equal pieces. Using a rolling pin, shape each piece into 3" x 12" rectangle, about 1 inch thick. 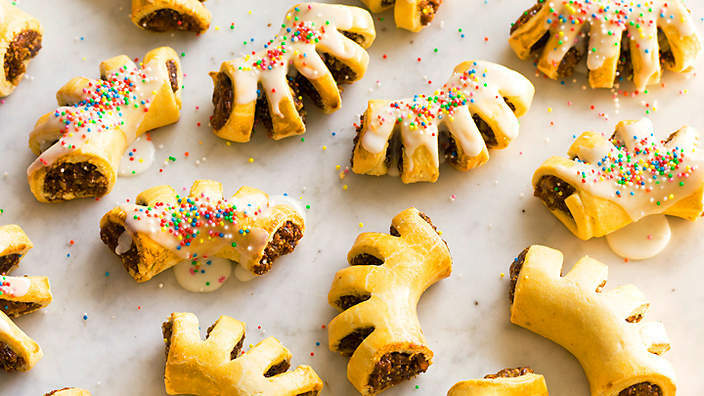 Place fig mixture into the center and entire length of the rectangle, roll the dough into a cylinder until the edges meet, pinching them together to seal. Turn cookie over so seam is on bottom. Repeat with remaining dough and filling. Cut the log into 3-inch long pieces and make 1/2-inch incisions along the side of the log. Place each piece into a parchment-lined baking sheet, about 1-inch apart. Gently bend to form into an arch. Bake cookies until lightly golden, 16 to 20 minutes, rotating baking sheets halfway through. Transfer to a wire rack to cool. Meanwhile, prepare the glaze (if using). With a fork, beat the whites until frothy. Add the 2 1/2 cups confectioner's sugar until you have a smooth paste the consistency of honey. Add more sugar if not thick enough and, if necessary, you can strain the mixture through a sieve again to make it perfectly smooth. Spoon or brush the glaze over the tops of the cookies and either leave as they are or top with colored sprinkles. Place the glazed cookies back on the baking tray and return to the oven for a further 5 minutes or until the glaze feels dry and set. Let cool completely before serving. Keep in an airtight container.